Audra Jennings: Where did #thebachelorette body guards go? 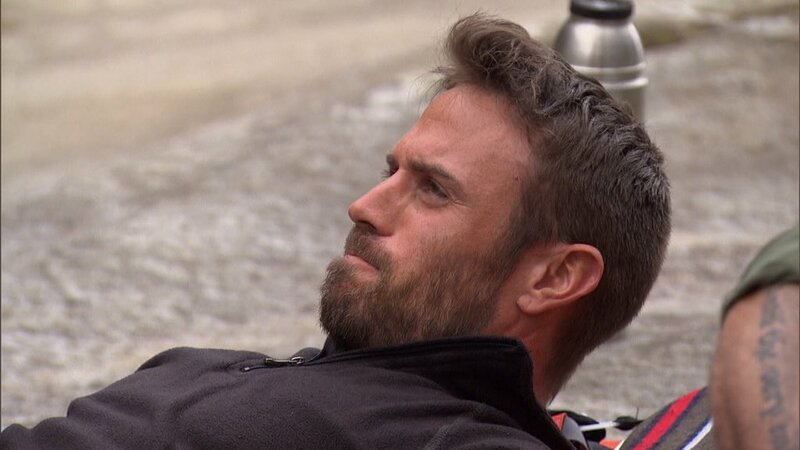 As Chris Harrison is outside talking to Chad, all the guys inside are predicting that Chad will be sent home. As Chris told him to do, Chad goes in to talk to the other guys and clear the air. Chad said it was no big deal and hoped everyone could get along. Evan says, "you owe me a new shirt and an apology." Chad says, "I'll give you $20." Other guys pipe in that they would all like to feel comfortable. Chad says there won't be problems as long as no one pushes or shoves him. He'll just leave everyone alone. Chad welcomes JoJo to the house when she arrives for their pool party. She's hoping they have fun and are relaxed instead of all the tension that's been going on. The fact tehy are doing shots this early in the day can't be good. I'm trying to figure out who keeps jumping into the pool in their suit. The guys do a synchronized dive into the pool, and Evan comes up with an accidental nose bleed. So that was a giant tease when the episode ended last night. The first one-on-one time we see is with Jordan. She's trying to figure out if he feels for her what she feels for him. It was evidently eye opening for him, but who knows why? It didn't seem like that big a deal. Chase is falling quick too, he says. She gets a chance to talk to all the guys. JoJo is kind of surprised how calm everything is with Chad. He's minding his own business and everything. But she doesn't know about the Chris Harrison thing earlier. Chad tries to play off his comments from last night, and say he's trying to figure out what she she's looking for, especially if she's into Evan. Before more conversation can flow, Evan shows up. No one mentions Chad until then. Then everyone talks about Chad. EVERYONE. Chad believed everyone had been talking about him all day. Chad did hear Derek talking about him earlier, so when JoJo leaves, Chad pulls Derek off. Derek tells him that JoJo asked him a pointed question. Chad talks smack to Derek about being in love with JoJo before he got there. Derek said he watched the show while Chad says he doesn't because he has a job. Chad could pick a fight with anyone for the dumbest reasons. As a reminder, last night Chase, Evan and James T. got roses. You knew that the last rose was going to be for him. That means Christian, Nick, and Ali are going home. Nick thought there might have been something there, but guess not. JoJo wants to leave all the drama of this week behind, so tells everyone to pack their bags to leave the mansion for good. For some reason - perhaps they tourism bureau put in the best bid - they all head to Pennsylvania. As one of the guys says, "It's a beautiful place to fall in love." The first date card reads, "Luke - I like you very mush." Their date consists of a dog sled (on wheels) ride with no snow. How odd. It is cold, so they strip down and get into a wood fire hot tub. He has to chop some wood first though. He asks how hot she wants it. "HOT." I have to admit though, Luke looks like he might work out more than Chad though. When they go to get in, she dips in her toe, and it's too hot. She has to help ease her in. Luke tells her it was kind of tough not having a date last week. (Oh, poor thing!) I just have to insert here that he reminds me of someone, but I don't know who. So, they are just listening to the birds tweet as they are out in middle of the woods. Luke says he grew up on a ranch so likes nature and all. JoJo says by looking at him no one could tell that. The tall stuff hair would throw someone off. At the resort, Alex, Jordan and Chase try to guess what might happen with the date cards. Where there be someone left out of a date? Will there be a two-on-one? Meanwhile, Chad is hanging out at his own hot tub comparing himself with a bear. There's a bear nearby they keep showing. You don't want to mess with either one of them. As the guys wait for the next date card, some thing Luke is going home. The date card does arrive... "Derek, James T, Daniel, Chase, Wells, Vinnie, James F, Evan, Grant, Jordan, Robby... We could go all the way." That leaves Chad and Alex without a date, so everyone suspects the two-on-one is coming up tonight. Back on the date. JoJo and Luke talk over "dinner." Luke got recruited to play football at West Point. He said he wasn't really prepared for that. Then, he was an officer with people's lives in his hands when they were deployed to Afghanistan. He then tells of a friend from back home who was killed in action. It's an intense conversation, and he gets the date rose. The next day is group date time. They head up the river, then out to the football stadium. They are going to play football with Ben Roethlisberger, Heinz Ward and someone else. The guys are playing around while JoJo recaps how it's going with the guys. Jordan thinks he has the edge here. The guys are more aggressive than she thought they would be. They knock the snot out of each other doing drills and hitting each other while in inflated balls. James Taylor gets hit hard and is bleeding from the head... bloody tease number #2. He needs stitches, but wants to finish out more of the date. Back at the hotel, Chad, Alex and Luke sit around staring at each other until Alex and Luke start after Chad. Now that they have warmed up, it's time to play ball! It's 5 on 5 with Jordan playing quarterback for both teams. Jordan says it's awkward, but at least he gets to go on the date either way tonight. Jordan thinks he's impressing JoJo. Evan ends up with a bloody nose again, but wants to play it off. The team with James Taylor (still bloody), Evan (bloody again), Derek (who had an injured calf), Vinnie and Robby wins. James F., Chase, Grant, Daniel, and Vinnie sulk all the way home. We see Robby's one-on-one time is shown first. He's falling in love day-by-day. Robby doesn't know if they did more talking or kissing. I thought they were going to go all the way on the pool table. Then she's making out with Derek. Then she kisses James Taylor's boo boo to make it all better. Jordan wants to know what's on her mind. She still has a lot of questions about him, she says. He makes her nervous because she can't read him. They go out to find a fountain to make out in silhouette in front of. When they come back in, it's time to hand out a date rose. Jordan gets the rose, and Robby is stunned. The date card arrives back at the hotel. "Chad & Alex - Let's get lost. Into the woods your bath goes, only one comes back with a rose." The guys ask Chad what he thinks he needs to do to stay over Alex. Chad gets stirred up and asks who all has a problem with him. He tells anyone who raises his hand to not talk to him. He wants to take it outside with Alex, the Grant, then who knows who else. The next day, Alex and Chad are packed and ready to go. One of them will be taking bag and going home. Jordan says something before they leave, and Chad threatens him that he can find him after the show is all over. Alex believes the day is a day of good vs. evil. They board the helicopter together. JoJo woke up unsettled, not knowing what is going to go on today. There are things she likes about Chad, but she's unsure. Alex is a stand-up guy, but she doesn't know if things are progressing there. The three of them are going to go on a hike. The three of them are going to be eaten by a bear. They really shouldn't have given Chad a hatchet. They all sit on a blanket in awkward silence. She takes Alex off first. Chad tells the cameras he better not say his name or he will take Alex's teeth home. JoJo brings up Chad first saying he hears they don't get along. Alex tells her that he doesn't want it to be about another guy. She asks if there is something she doesn't know about. Alex tells JoJo about the altercation with Jordan earlier. JoJo realizes there is actually stuff going on she didn't know about. The Chad she knows is the sweet, sensitive guy. He's so fake when he talks to her. He says the guys thought it was going to be a big deal today between he and Alex, but he doesn't know why. He laughs it off when she starts voicing her concerns. Chad says he is not an aggressive guy, certain guys just push him. He says he's tried to talk it out with people. JoJo isn't buying it anymore. She wants some time alone to not make an emotional decision. She tries to give Chad the benefit of the doubt since he lost his mom 6 months ago. Chad kept telling Alex to mind his own business, so now I think he's going to push him in the river or get out the hatchet. Chad lays down on the blanket beside Alex and says, "I'm not very happy with you. I'm not angry, I'm just disappointed. Life ain't all blueberries and paper airplanes." Chad tells Alex he can't hurt him right now without getting in trouble. They then get into a war of words. JoJo comes back, hugs them both, then sits in the middle of them. She says the day has been confusing for her. She asks Chad point blank if he has made any threats. He admits he can't 100% deny it. She picks up the rose, tells Chad she doesn't think he's the person she thought he was, so asks Alex to accept the rose. She tells Chad it's time to say goodbye now. Back at the hotel, the random crew member comes in to get Chad's bag. The men celebrate. Chad is in the woods plotting his revenge against Alex while Alex and JoJo are sipping their champagne happy to not have to talk about Chad again. Chad goes back to the house to confront the guys and knocks on the door. NOW WE HAVE TO WAIT TWO WEEKS TO SEE WHAT HAPPENS NEXT.